Set in Paris, 1941, A Picasso, is an hour and seven minute interchange between the 61 year old painter and an attractive female German agent in a vault beneath the city. Just the two of them engaged in a verbal tango. No extra steps, few unnecessary words, each alternately seductive and menacing. It is spare, clean, witty and biting. Jeffrey Hatcher, a former MacArthur Fellow and winner of the Barrymore Award for Best New Play of 2003 for A Picasso, has beautifully evoked the legendary Picasso (Peter Michael Goetz): an ego that exceeded even his own towering reputation, arrogant, and with sexuality permeating every action. Picasso devours women with passion and disdain, alternately dismissing any woman whom he does not consider a worthy adversary, and destroying those he feels are competition. It is a seduction only Picasso could pull off: The coup de grace is delivered when he quickly draws a portrait, signs it and makes it a present to her. Hard to resist coming from the legend himself. 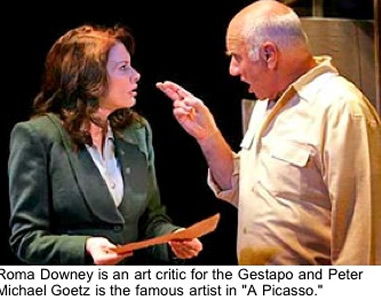 Miss Fischer (Roma Downey) is a fictional character, a voluptuous German interrogator who has been sent by her superiors to authenticate three Picasso drawings that are without provenance. Her mission is to assemble a “group show” of contemporary greats, Picasso most prominent amongst them, so that her superiors can then burn their “degenerate art” in the name of Nazi purity. All art that does not depict “kittens and dogs” is degenerate and Picasso’s especially so after his completion of Guernica. The only person who could positively identify these unsigned drawings would be Picasso himself. And Picasso is so full of himself he can neither claim the drawings only to have them burn, nor disown even one to save the other two when offered the chance … even if his own freedom is at stake. They are his children. He challenges her about his seeming (if not de facto) arrest as he has left a restaurant where he just finished lunch. Protesting that he is guilty of nothing, she replies, her Teutonic thoroughness and ramrod posture totally unruffled, “We’re all guilty of something. You just have to find the right law.” She is a German agent in Paris in 1941. Picasso alternately spars and flirts with Miss Fischer. She asks him to describe the drawings as though he were a critic. He pulls the same from her. She plays the critic with remarkable skill, revealing her background in art and her motivation for self preservation which has led her to acting as a Nazi agent. While never loosing their edge, each becomes attracted to the other. Miss Fischer becomes a necessary conquest for Picasso. Francois-Pierre Couture’s spare set makes excellent use of the interesting Audrey Skirball Kenis Theater at the Geffen Playhouse. A smaller space than the main stage, seats are arranged on two sides of the stage so that the audience is divided in half and faces each other across the action. Unlike theater in the round, this leaves two opposing end walls to complete the scene and results in much less loss when actors turn to the opposite side. Under Gilbert Cates’ direction most of the action is viewed in profile, thereby granting everyone near perfect viewing and producing the effect of being in the interrogation room. The sense of menace and the sexual charge are palpable, however, if there is a bone to pick it is that the dialogue is delivered slightly slowly for the genuinely witty remarks to shine. Hopefully, as the run progresses, the pacing will be remedied. A tightly written piece packing so much in barely an hour’s time, A Picasso, deserves the very best and this production comes very close.